Day tour 1 (minibus): Brecon Beacons National Park - "Mines & Mountains"
National Mining Museum of Wales "Big Pit" at Blaenavon+, Brecon Beacons National Park: including Brecon town, Brecon Cathedral, iron age hill fort - short walk (optional). *Minimum numbers apply to every tour. +Big Pit underground tour not always available. Day tour 2 (minibus): Wye Valley "Romans & Ruins"
A tour to the Roman fortress town of Caerleon and the Wye Valley including Tintern Abbey. 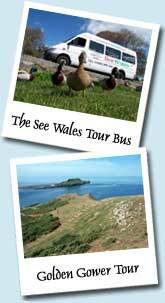 A tour to the spectacular Wales coastline of Gower Peninsular. 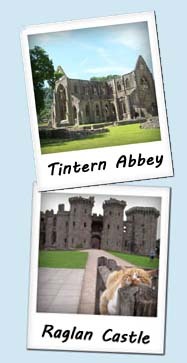 Price: Adult £45.00 | Saver £40.00 | Child £25.00 (2019) *Minimum numbers apply to every tour. Tour 4 (city walking tour): "Essential Cardiff"
This fun and informative walking tour is perfect introduction to the Welsh capital city. It's available for groups only in 2018, sorry. Explore the city's history with your local guide and also find the best places to visit, see, do, eat and drink during your visit. Tours start from Cardiff Castle front entrance (city walk), Wales Millennium Centre (bay walk). Booking is essential. Highlights include seeing the best of the city and bay. City walk - Cardiff Castle roman wall, Animal Wall, Bute Park & Arboretum, stone circle, City Hall, National Museum, Gorsedd Gardens, shopping district with arcades, indoor market, national stadium. Bay walk - WMC, Senedd, Cardiff Bay Wetlands, Norwegian Church, Mermaid Quay, Coal Exchange Hotel. Minibus day tours depart daily at 9am from the front steps of the National Museum & Gallery of Wales, Gorsedd Gardens Road, Cardiff, CF10 3NP. (March-September). 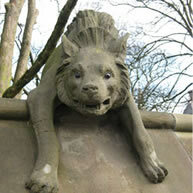 Walking tours start from Cardiff Castle or Wales Millennium Stadium. Pre-booking is essential for ALL tours. Minimum numbers apply to every tour.